The book covers up-to-date information on nucleosides and antiviral chemotherapy contributed by the world experts in the field of nucleoside. This book is the result of a meeting honoring Dr. Jack J. Fox, who was one of the pioneers in nucleoside chemistry and chemotherapy. 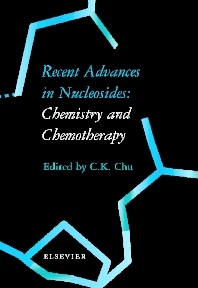 This book consists of 15 excellent chapters in the area, which include topics from recent synthetic methodologies, nucleoside kinase implicated in chemotherapy and drug design, excellent reviews on antiviral agents, nucleoside metabolism/mode of action in parasites, new compounds under clinical and pre-clinical trials, IMPDH inhibitors to review on nucleoside prodrugs. (E. DeClercq). 16. The role of the cellular deoxynucleoside kinases in activation of nucleoside analogs used in chemotherapy (S. Eriksson et al.). 17. Cellular transport of nucleotide analogs (T. Cihlar et al.). 18. 5-Aza-7-deazapurines: synthesis and properties of nucleosides and oligonucleotides (F. Seela, H. Rosemeyer).